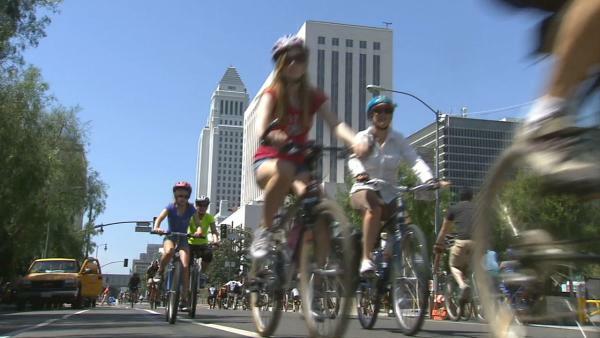 Just this past Sunday, Los Angeles held its fifth CicLAvia event, where the city shuts down a major roadway to make room for bicyclists and pedestrians all over the city. Last weekend’s events shut down Venice Blvd, all the way from the beach into downtown LA. 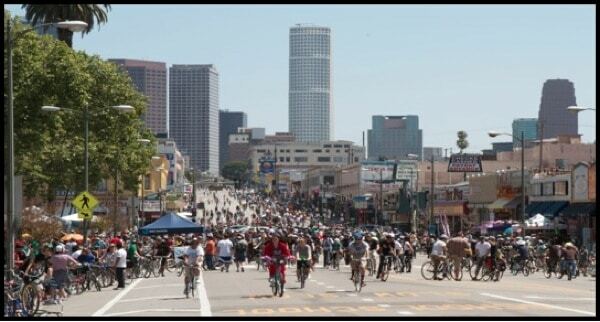 Thousands of Angelenos took to the streets on their bikes, some just tooling around the areas where they live, and others making the entire trek from one end of the route to the other. CicLAvia is modeled after the ciclovias that started in Bogota, Colombia “as a response to the congestion and pollution of city streets.” Here in LA the purpose is “connecting communities and giving people a break from the stress of car traffic.” We don’t have bicycles, but we met friends for lunch who were riding inland from the beach, and popped down to the route on foot to check it out. It was a sea of bicycles! So could we do it? Give up our cars in exchange for bicycles as our primary means of transportation? Here are some of my thoughts on the matter. rainy days would be pretty unpleasant… maybe we could also institute “rain days” at work…? What are your thoughts? Do you have a bicycle at home, and would you be able to replace your car with it? This entry was posted in Life & Los Angeles and tagged #anecdotalgoat, #bicycle, #cyclavia, #earthday, #energy, #environment, #sustainable. Bookmark the permalink.